Weekly Photo Challenge: Contrasts | Oh, the Places We See . . .
← Colfax, Washington’s Codger Pole: Never too late for a rematch! 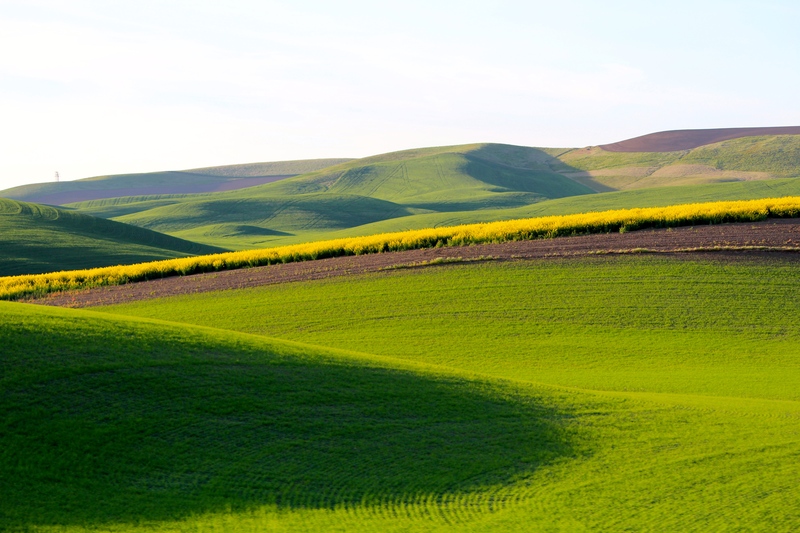 Contrasts come naturally on The Palouse, that area of rolling farmland in Eastern Washington and parts of Idaho. Sunlight, storms, shadows — all contrast nicely with the overlapping fields of wheat, quinoa, oats, and canola which form contrasts of their own. You might think that 5,000 square miles of agricultural landscape would get monotonous, but not when you look for nature’s own contrasting elements. 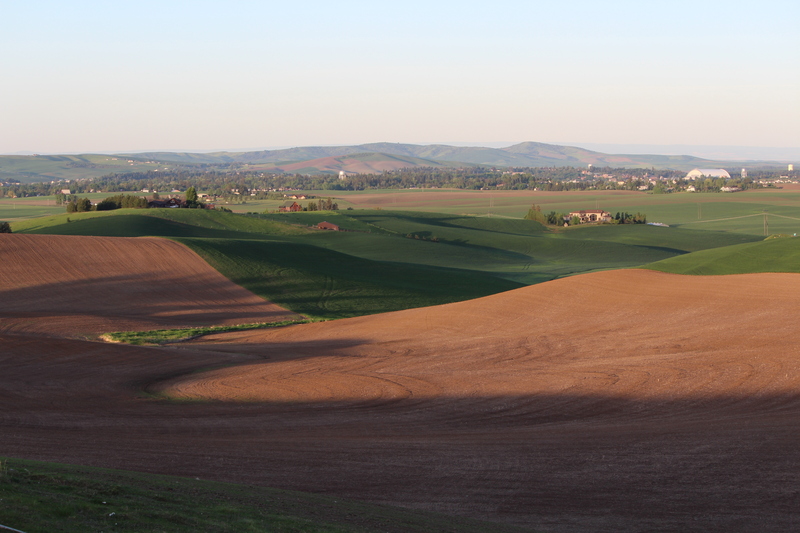 Shadows formed by clouds overhead and the direction of the sunset creep slowly across The Palouse. 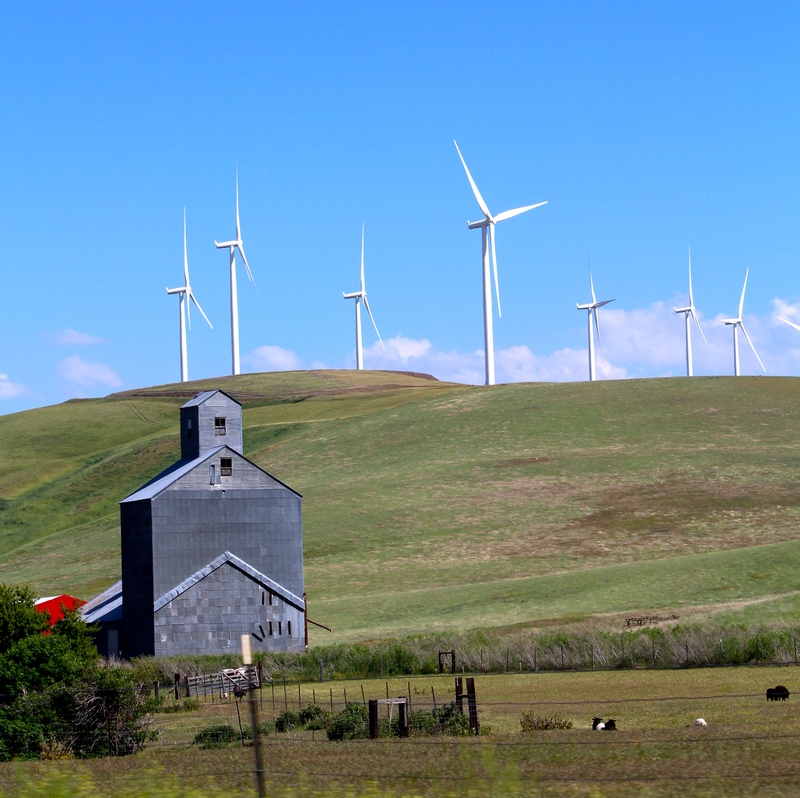 The newness of a wind farm on The Palouse contrasts with an aging, long-standing structure. Shadows reach forth changing colors on green fields, but a new yellow field of canola forms a contrast all its own. Backlighting from a puffy-clouded sky casts a dark shadow on the landscape in the foreground. For more entries in this week’s Weekly Photo Challenge: Contrasts, click here. For more posts on the Inland Northwest in all its beauty, check out our page at the top of this blog: Inland Northwest. 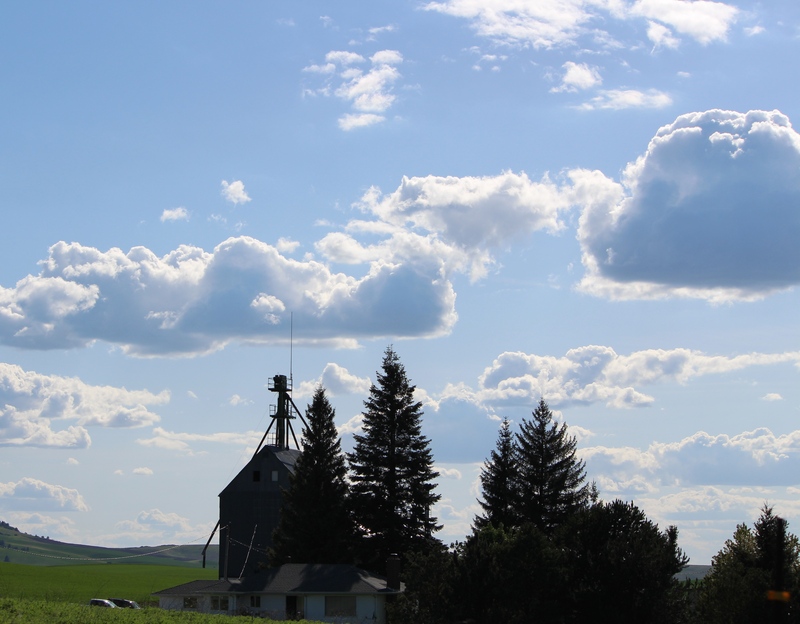 This entry was posted in Idaho, Photography, Travel, Weekly Photo Challenge and tagged canola, clouds, Palouse, postaday, sky, wind farm. Bookmark the permalink. Sharp and clear photos/colors. Wonderful entry. Thanks so much. I think these were mostly taken when we stopped, but I have several that were shot out of a car window while my husband drove!!! (Anything for a picture, I guess.) Thanks for reading! I love the colours in your photos, Rusha. Such wonderful scenery and open spaces. They pick up ‘contrasts’ very well. Thanks so much. My photos are decent, although I’m no photographer per se. The landscape at The Palouse lends itself to great shots, and I can only imagine what it would be like to live there with the luxury of getting out in the early morning or late evening hours to see the shadows unfold. Appreciate the comment. Thanks so much. It’s the joy of travel, right? Seeing something in new ways! So do I!! Did it as a girl. But not as a woman — but who wouldn’t want to relive those carefree days! Thanks for reading! Thanks you so much. I just love that part of the country. And I’m not sure if I’ll ever get back. Just savoring the moments by going through the pics whenever I get the chance. Appreciate the comment. Thanks so much. It was fun to look through my pictures again and see the contrasts. Appreciate your thoughts, as always. These are beautiful, Those are some wide open spaces, lucky you! You are so right — wide open spaces and the good luck to be healthy enough to travel and see this beautiful part of America. Thanks for taking a look and leaving a note.